You'd think an entrepreneur who lost a tech business in the dot-com bubble, only to get a job in the subprime mortgage industry right before the housing collapse, would consider himself cursed. But after these two strikeouts, Warren Royal took one last swing -- and scored his biggest business hit to date. This time, tossing aside the decades of skills he had developed in the mortgage and IT industries, he started a business based on a whim and one word: bobbleheads. Royal bought the domain name for Bobbleheads.com at an auction, though his previous experience with the iconic toys consisted of him owning a few and thinking they were "cool." It was only after he bought the domain name that he became aware of the pent-up demand for a bobblehead retail site. "I saw the domain name as an investment that I could trade, but it wasn't until I acquired it that I started to understand I could build a business from this," Royal said. Today, he sells bobbleheads not just online but in museums like the Smithsonian and Library of Congress. For once, Royal was in the right place at the right time, and has been able to turn his impulse domain-name purchase into a seven-figure business. How did you end up involved in the dot-com bubble? I come from a long line of entrepreneurs, so my natural tendency was to do something entrepreneurial. I first got into tech in 1987, before the Internet was popularized, and then the Internet started stimulating concepts and ideas and entrepreneurial ventures. I founded an ISP company in 1995, and during that process was exposed to domain names and website design. I ended up selling that off to a larger ISP but retained the website development portion of the business, and we did very well until the bubble burst in 2000. Did you know the dot-com bubble would burst? Oh no, everybody thought it was permanent. The revenue was great. But overnight when the dot-com bubble burst, the advertising revenue went down to a tiny fraction -- 5 percent -- of what it had been previously, because people weren't advertising anymore. We had a great platform without any revenue to support it. Did you think it would be safer to work in the mortgage industry? Yes, initially, the mortgage industry was my comfort zone. I found an IT position with a mortgage company in 2003, where I built a data center and ran a large IT group. It was a large wholesale subprime mortgage lender, which at the time sounded like a great idea. Subprime lending was a big element of the mortgage industry. There was a lot of legislation driving mortgage lending to disadvantaged borrowers -- people who weren't able to afford traditional mortgages. Mortgage companies were being penalized at the time for profiling applicants and not lending to disadvantated areas, so increasing the amount of loans made available to those types of borrowers and coming up with alternative products was the cool, fashionable, popular thing to do at the time. I think we felt like we were doing a service -- we were offering mortgage products to people who could not otherwise afford them. When did you realize you were in the middle of another bubble? When the housing pricing turned around. When the prices are doubling every year, no one cares if the future mortgage is a little too expensive for you, because you can get out and make money, but when house prices start to plummet, that's when you get caught. Prices went down, demand went down, people stopped buying. I started seeing mortgage companies going under. I had been working for two companies in the industry in 2006 and 2007, and both went out of business within a week of each other. On Friday, they had tons of cash in the bank and on Monday, they were gone. What did it feel like to be a casualty of two bubbles? It was very concerning. I still had my skills in technology and in the mortgage industry, but there were no companies left that I could work for. I decided to take time off and dust off some of my old Internet projects. During the 1990s and 2000s, I had acquired a number of domain names, so I did some buying and selling of domain names, kind of passively while considering my next career move. One day I was in a domain auction, and the name bobbleheads.com came up, and I thought "that's pretty cool," so I started bidding. I bought it for $29,000. I didn't know anything about the bobblehead industry -- I thought they were cool and I had collected them at some point. I threw together a website in about a week, did Google searches and tried to locate the different manufacturers to call people and try to learn about the bobblehead business -- how they were made, how they work, what the different types are, what the popular figures are. Then I bought about $500 worth of inventory, which I put in my basement. We had orders from day one. Many people don't realize this, but having a good domain name like this is important, because you have built-in traffic. 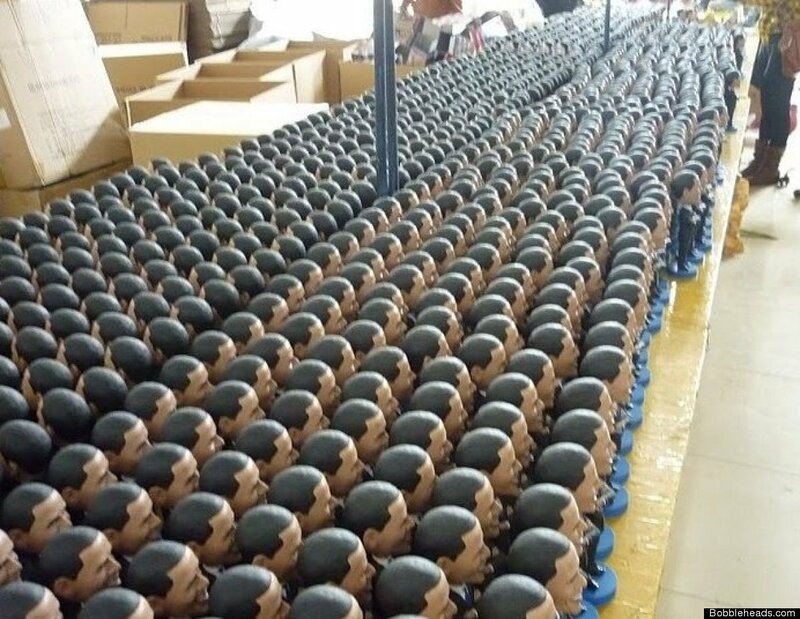 From day one, we were getting about 500 to 600 users a day just typing in bobbleheads.com and expecting to find bobbleheads. What was the breakthrough moment when you realized this could take off? As luck would have it, this was 2008, the year of a momentous presidential election. There was a lot of excitement in the air about the election, and a lot of people were looking for political figures, so I found Barack Obama, John McCain, Rudy Giuliani and Hillary Clinton. Everything we bought, we would sell out of almost immediately, and I saw this was going to be big. I would personally take the orders and do all the packing and shipping from my basement. Eventually, we ran out of space in my basement, so I had to get a mini warehouse, and that was full so we had to get a second, and that was full so we had to get a third. Also during that time, Sarah Palin came on the scene, and everybody wanted Sarah Palin or Michelle Obama bobbleheads, and no one had those. So I saw a real gap in the marketplace for products and for quality. Most of the stuff out there was poorly done, honestly. I said I think we can do better, so I got on a plane and went to China, interviewed factories and sculptors, and started to produce our own products to fill in the missing pieces. That was the beginning of Royal Bobbles. The first three were Sarah Palin, Michelle Obama and Ted Kennedy, and we now have about 60 different designs. Another thing I noticed was that people were looking for custom bobbleheads. About 50 percent of the people coming to the website were looking for, say, bobbleheads of their boss, girlfriend or cake toppers for their wedding. When I was in China, I met with some factories that could do that type of work also. Today, the custom channel does more volume than either of the other two. Why is a bobbing head so appealing? That's a really hard question. I don't know -- it's a pop culture thing, I really can't explain it. People think they're funny, they're cute, they're conversation starters. I don't know why a bobbing head seems to make that much of a difference over a doll without a bobbing head, but it does. It makes it more humorous. Everyone likes bobbleheads. Is your goal to be the number-one source of bobbleheads? That is our goal, but primarily we have been focusing not just on quantity, but more on quality. We're dealing with some of the best licenses in the country -- John Wayne, Einstein, Hitchcock, Elvis. We're the only company that has sold bobblehead products into certain museums -- in the Smithsonian, Library of Congress, Arlington National Cemetery, Ford Theater, Gettysburg, Washington's birthplace. Many of these places never carried bobbleheads before, but ours are so well done. We work with curators and historians to make sure we get all the facts and figures and details just right, such as the details of uniforms. Collectors appreciate that. We sell them about as fast as we can make them, but our goal is not just in terms of volume, but to sell the highest quality pieces. So this business has surpassed those you started in the fields you did have experience in? Absolutely. I'd been in the tech business for long time, and I just got tired and wanted to do something totally different, and this is about as different as you can get. I didn't expect to be doing this kind of revenue back then -- I would have been perfectly happy to continue to do this out of my house. More than anything else, it just seemed like a lot of fun. Everything I did before was intangible -- tech is intangible, mortgages are intangible, even the systems we bought during the Internet craze were all intangible systems. This is tangible. You can hold it in your hands and show it to people and take it home and see smiles on people's faces. It's very low tech, but something you can hold in your hand, which is far more fulfilling to me. And if it's tangible, that means the business can't just disappear from a Friday to a Monday? This time, I'm in control of my own destiny, and both other times we were victims of other forces that we had no control over. The subprime thing was universal and not about anything we did, and neither was the Internet bubble. I'm not aware of a bobble bubble at this time, but we are very strongly positioned. I think we're going to be here for a while. 2012 Projected Revenue: "7 figures"
Finally benefiting from good timing, Warren Royal started his bobblehead business right before the 2008 election, when demand for political bobbleheads was booming.